During the past days, I had the opportunity to give two conferences. One in Raleigh, North Carolina, on October 20, 2015, for the Red Hat Agile Day. 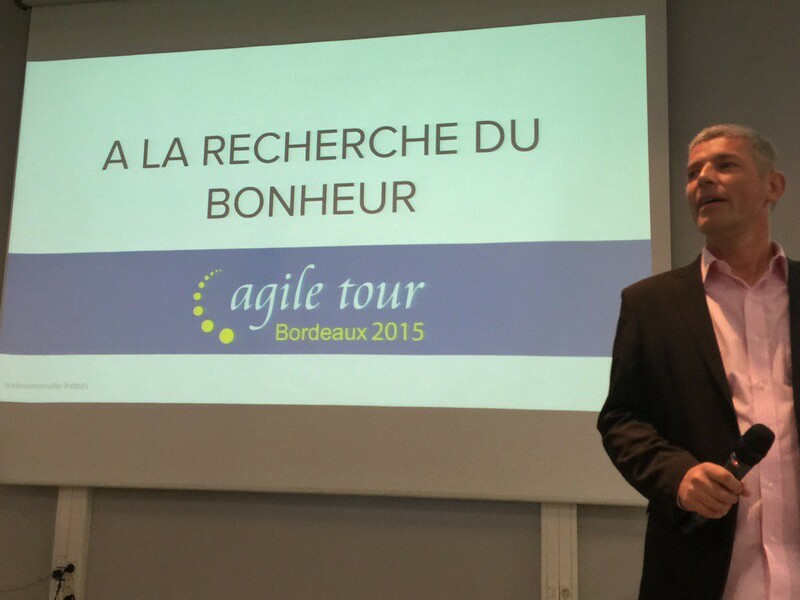 The other, in Bordeaux, France, for the closing keynote of AgileTour Bordeaux, on October 30, 2015. I adapted the content according to the feedback received after my opening keynote of the Drupal Developer Days. Studying this sentence helps to understand the state of mind of the manifesto writers, continuous improvement, mutual aid, listening. We could apply the same way of doing things to other areas than software development ones. And, of course, there’s no reason to restrain the application to one team. Some practices and tools proposed by some framework limit the application to a team. Culture is the immerse part of the iceberg. When you observe an organization, you will be able to see the tools and practices. The principles and values that define the culture are seen through the actions of the organization members. When you try to introduce practice and tools that will not fit the organization culture, even if there’s an improvement at the beginning, things will be back to “normal” after some time. culture eats strategy for breakfast, technology for lunch, products for dinner and soon thereafter everything else too. Those principles were: autonomy, responsibility, trust, transparency, communication, and the conviction was that growing agile would be the way to achieve it. As the company was growing fast, we wanted to know if we were heading in the good direction, and if employees were really happy. And the best idea we found to get this information was to ask people on a day to day basis, using 3 simple buttons and a form to collect feedbacks so we can know what we could continue doing, what we could change or stop doing. A simple question, I was not able to give an answer to. Everybody knows what is happiness, but I was not able to define it. That leads me to follow the Science of Happiness Berkeley course of Dacher Keltner and Emiliana Simon-Thomas. I learned a lot on what is happiness, differences between happy and unhappy people, and mainly how to become a happier person. Answer may not surprise you, it’s not a new car, even a fancy one. Circumstances like that will have an effect on our happiness level, but we will go back to our set point soon or later. 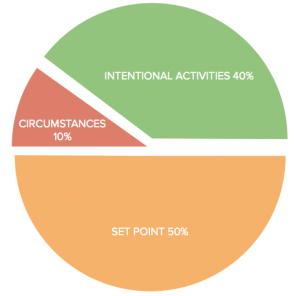 The most important finding, according to me, is that our happiness depends by 40% on our activities, and not on our genes or the circumstances. We can choose to have an impact on our happiness level. Being positive. Trying to look at situations from other angles in every day to day life situation and relationship with others. Being optimistic. Investing time as an individual and as a team to define what could be our best possible future. Working to create the conditions that help people to do their best. One of the proposed exercises is for example to write your self portrait, your best possible self. Taking 10 minutes a day to write and refine this portrait during 10 days will learn you a lot on yourself and what you can do. Expressing gratitude. Creating the conditions that help people to do the same. In organizations, Retrospectives are good opportunity to do so, you can organize Kudos Box, or distribute Wow cards. It could be done using a diary, encouraging people to do the same, especially interns and new comers, so they can keep a trace of their surprises and learnings that could be useful in the future. Practicing kindness. Kindness letters are a simple way to do so. There’s even a world kindness day on November 13th, that could be a good opportunity to do something as a team. Forgive, a practice simpler to say that to do, especially when it’s our turn to forgive. A practice that, like gratitude and kindness, is the more beneficial to the sender than the receiver. Practices that work even in the absence of the receiver. Savoring life’s joy is a way of life. Celebrate success, our own successes or the successes of a team or an organization, is an important, not so usual, activity. There’s several ways to celebrate success and we need to find our own, a way to do it is to set up a work expo as proposed in Workout from Jurgen Appelo. Celebrate success supposed to define goals. Several scientific studies on this subject demonstrate that goals must be intrinsic and not extrinsic (like money). Defining goals, prefer approaching ones to avoiding ones. That’s why I like the OKR approach (Objectives and Key Results). Because the objectives and key results are created through the conversation of all stakeholders and not hierarchically imposed. This is also an excellent opportunity to look at objectives in more shades than the binary black and white, and to consider each steps in the good direction as a partial success that we could celebrate. Contribute to a goal bigger than self, with people you appreciate. Create your tribe, troop, group in which you will be able to connect, share, learn. Your surrounding will have a dramatic influence on your ability to deliver. Surround yourself with passionate people will give you a lot of energy. You can also provide this energy to the people that surround you. This quote from Juvenal has been repeated since… To remind us that we have a body and that when we take care of it, it has an influence on our mind… and so the opposite. And more than sport, ideal activities to practice with personal or professional relationships, meditation can be an opener on the happiness journey. Happiness at Work implies that we could be happy or not depending on where we are. Work life balance separates two worlds in where we will not be the same person. Maybe it’s time to behave as only one person, without any professional mask? Maybe it’s time to be happy in life? Maybe it starts with us, with our smile? Thank you for your feedbacks at the end of the conferences and your messages on Twitter. You will find more links to dig the subject in the original post published at alexis.monville.com on November 2, 2015.